“At the moment, less than 7% of Europe’s needs are covered by wind power, biofuels or solar energy. But in the Navarra region, in north-eastern Spain, almost 70% of the electricity comes from the wind and the sun. You do not have to look far in Navarra to see a windmill. 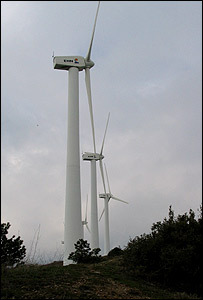 Not the sort that Don Quixote fought, but the hi-tech turbines that provide much of the electricity here. With no coal, oil or gas of its own, this mountainous region deliberately went for renewable energy in the late 1980s.Â The first wind farm was built in full view of the regional capital Pamplona, so that people could get used to it.